Attention Parents – Do you want your kids to see you as the superhero that you are? Do you want to be the Wonder Woman or Superman of the kitchen? This is the recipe for you. The creamy, melted cheese…the savory bacon…the light, buttery crust. Oh yeah! Superhero time! This is a nice, hearty meal for those kids just coming home from a soccer match or just off the baseball diamond and need to recharge. What is not to love? Mac and Cheese. Bacon. Crescent dough! 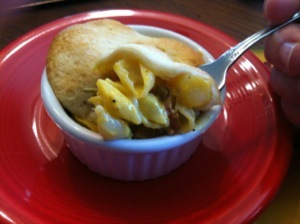 These little pot pies are big hits! 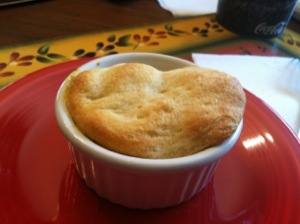 You can make this as one big dish, but I made it using ramekins. Two small ones were a hearty meal. 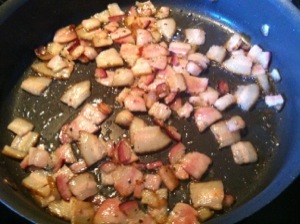 The bacon (to quote Homer Simpson “mmmmm bacon….”) moves from pink…. to brown. Move to paper towels to soak up a little grease. In the ramekin. The magical combination of bacon and cheese is buried inside the pies. The tops are on. The leftover dough is in the center of the sheet. Out of the oven and into my heart with an explosion of flavor! 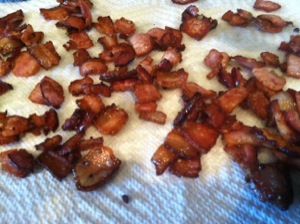 1/2 lb bacon (thick cut is best), cut into 3/4″ pieces. Preheat the oven to the temperature indicated on the dough canister. Make the mac and cheese according to directions. Fry bacon until almost crisp. Drain on paper towels. Save some bacon grease. Mix with mac and cheese. Cut out the tops – Flour a surface open up the dough. Take a glass that is approximately the same diameter as your ramekins and flour the top edge of the glass (so the dough won’t stick). Press the glass down on the dough until you reach the surface, then turn to cut the dough. Butter each ramekin thoroughly (or use the bacon grease). 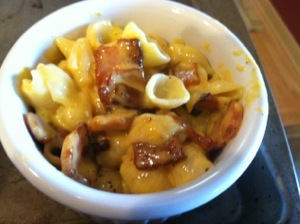 Fill the ramekin to the top with the mac and cheese/bacon mixture. Top with a cutout of dough. 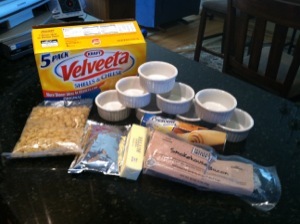 Melt a little butter and brush the dough on the top of each ramekin. 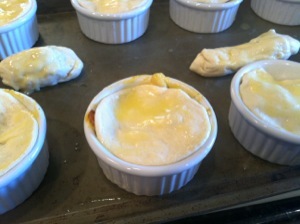 Place ramekins on a cookie sheet and turn any leftover dough into rolls and place those on the sheet as well. Put the sheet into the preheated oven. Bake according to the time on the dough canister.